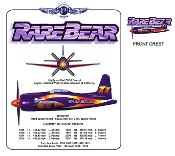 Rare Bear is one of best known air racers winning 8 national titles since the late 1980s. Small crest on front, large design on back. One-sided design has large image on front, nothing on the back. Available as a T-shirt or a Sweatshirt. Available in White, Natural and Ash Grey. Copyright © 2007-2019 Aviation and Military Collectibles. All rights reserved.